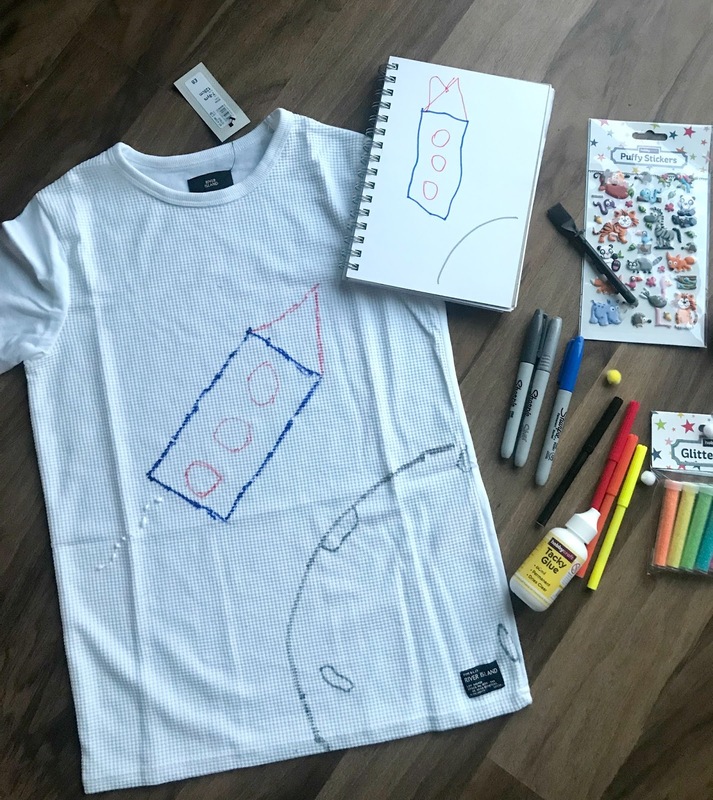 Hello lovelies, this month the lovely team from River Island sent Oscar a boys T-shirt from their store and asked if he could put his own little design on it, so me and Oscar took ideas to paper and came up with something! 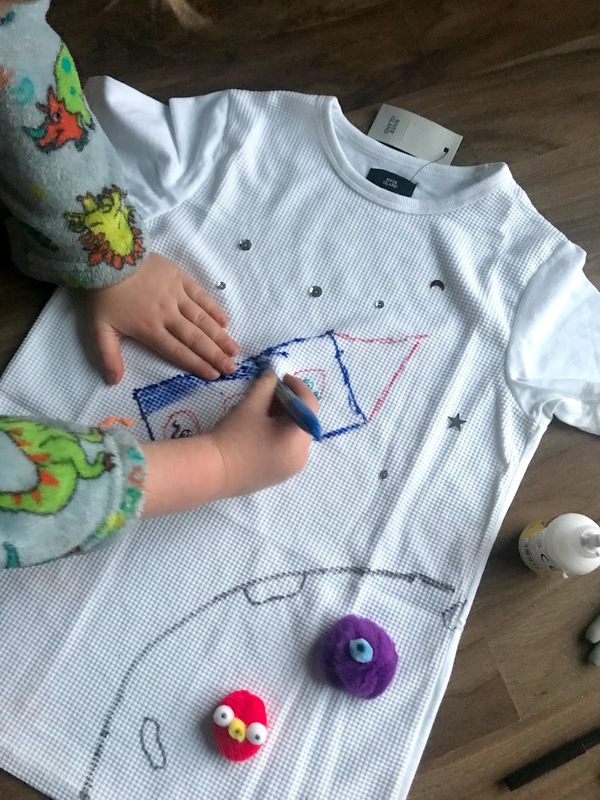 So it started of with this plain white waffle hem t-shirt, we got gifted some arts and crafts from hobby craft and rolled out lots of different ideas in my notebook, Oscar loves rockets, space and anything to do with it. He loves a book at the minute 'my smelly alien' so we got all of those ideas and put them on his T-shirt. You've heard of the film 'Snakes on a plane' right? Well we did our own version, snakes on a rocket! 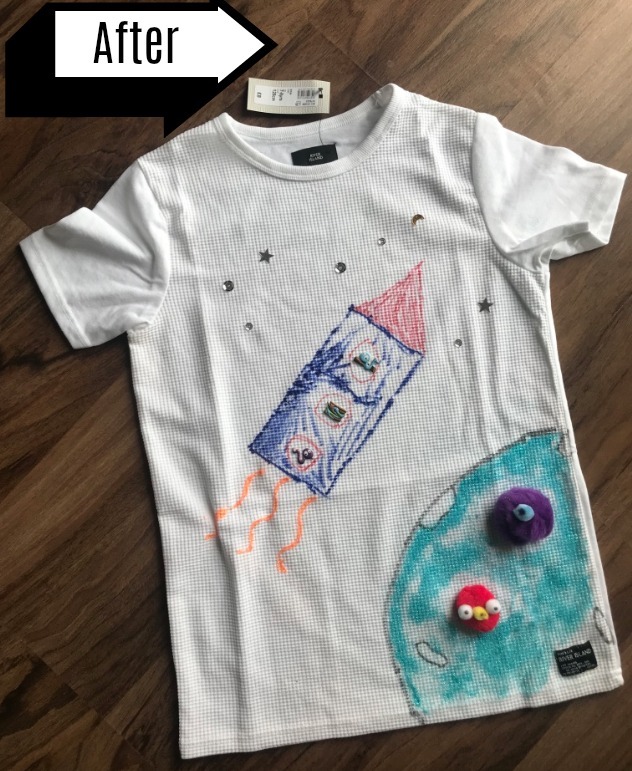 So Oscar started of by drawing some sort of planet, then his rocket adding a bit of orange sparkly fire, we then added pom pom aliens one accidentally ended up looking a bit like an angry bird but we couldn't find our googley eyes! We then added sparkly silver stars and more glitter for the planet. 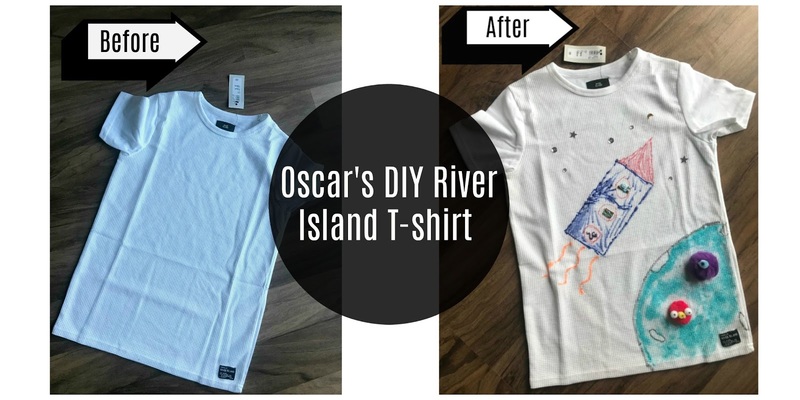 Oscar was so pleased with the finished result and now wants to pimp up all of his plain white tees! 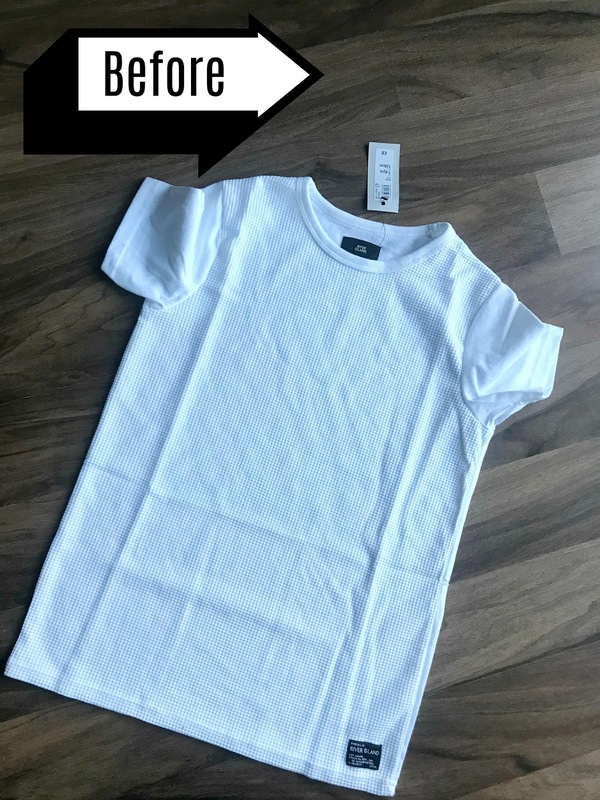 This was such a lovely activity to do so if you have a plain white T-shirt hanging around that might not even be that white any more why not create your own DIY over the christmas break and have fun with it. Oh wow what a great idea, I love the space theme. The aliens look so cute. Ahh I love this! What a great idea and well done OScar, that looks fab!! We love to do crafts like this, I bet my girls would adore making their own! Ah this is absolute cuteness! It actually looks like a funky shop bought one, and I bet he really enjoyed creating his own design. Oscar's t-shirt design is super cool. Love the snakes on a rocket (hope he hasn't seen the movie Snakes On A Plane, mine you 😁). Future fashion designer in the making! Such a brilliant idea. 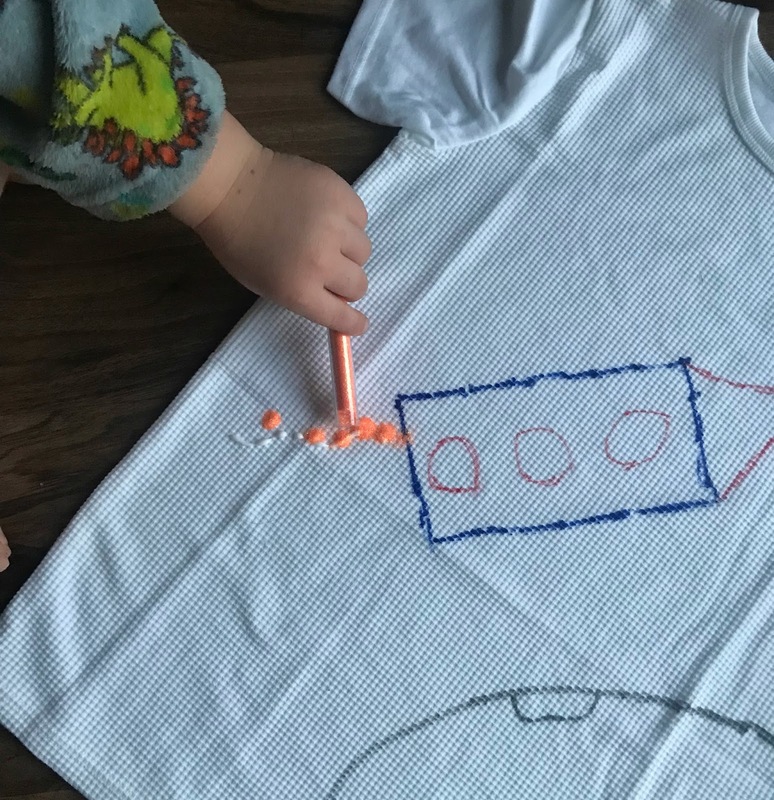 I'm sure my boy would love designing his own t-shirt so will have to try this. Awe I love the space theme! If I had to make a shirt it would probably look the same! I love it! This looks like a lot of fun! I'd wear that shirt everyday if it fit me. I used to draw on my shirts back in the days. But they are too small for me to wear now.